The last two of my Fox in Flats September Style Dare outfits! The style challenge for the day was "Sparkles". As I don't have anything covered in sequins, I thought about my star print top or the metallic jeans, then thought about wearing both together. When I put it on I wasn't sure if it was too much, the star print and the shiny jeans. But I figured the point of participating in style dares is to try something different and wear something you wouldn't usually, so I happily wore both out to my mother's group with baby. Sadly, I didn't get a chance to wear this outfit anywhere after the mother's group. Right as we were about to leave, baby T felt unwell, and my clothes copped it. Had to throw them in the laundry right away! It was a fun outfit to wear for a few hours though. If I hadn't had the challenge, I definitely would have picked a different top. Last worn: Wayfarers, star print blouse, metallic skinny jeans, Havaianas. This was the last of the style dare outfits I managed to photograph for the blog (I played every day on instagram but didn't always get a blog photo). Kinda fitting in with the "all black" challenge with a black maxi skirt, but only by chance. I wore this a few days after the mother's group outfit above, when my mum and sister came over for the day to help me take care of baby T. We had planned a girly day out shopping, but with baby still being unwell, we couldn't really go anywhere. We are blessed to have so many family and friends who will help us care for baby and work around his needs. I thought life with baby was messy, but life with a sick baby is so much worse. Really happy baby T is back to normal now! 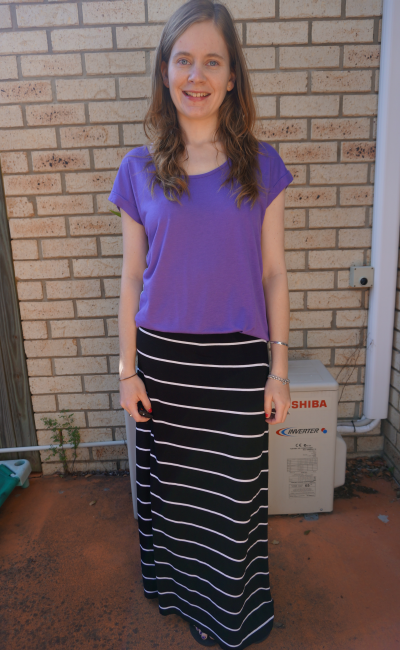 Last worn: purple tee, striped maxi skirt, Havaianas (above). Linking up with Fashion Item Friday, Friday's Fab Favourites today. 2 Great outfits, Mica. The star blouse (I own a similar one) and maxi skirt are so cute. I'd wear both of these poutfits. So simple yet totally put-together. Enjoy the weekend, pretty lady! <3 Ada. Great flip flops, Mica in that metallic tone and the maxi skirt is awesome on you. Man that was way nice of you to tell me I can have or do anything I make my mind up to. Wow, that is a grand compliment, especially now. So glad we are friends! Fashion ITEM Friday is always great with you here. Love that purple top with the strip long maxi skirt. I have been living in long skirts in the past two months. I hope to find more for the winter season as I love wearing tight and boots! Skirts can be great in winter - maybe even with leggings underneath, haha! Thanks Louise! It wasn't fun, but he is back to his normal self now. So nice to see him smiling again! Those metallic jeans are so cool! Great idea, using a star pattern to convey "sparkles" - you're so creative! That top is very pretty on you! And I hope baby T gets better! I wasn't sure I'd have enough sequins - so thought the star print would do, haha! I really like that first outfit, Mica! Sorry to hear baby T was sick on them! Those metallic jeans and printed top look so good together Mica! And I love that purple top and striped skirt. I have one I haven't worn yet. It has a black top, but purple is another option. Aw, hope Baby T feels better soon! I absolutely love those metallic pants - so fun and loved that you challenged yourself to wear something a little bit out of your comfort zone! I love the purple and striped maxi outfit. It's fun, colorful, and relaxed looking. Very cute. That star shirt is divine. Love it and sad to hear baby T had other plans for it. Oh well, you still had some fun with it. And great to see that striped skirt out and about again.